The Hurva Synagogue (“Ruin Synagogue”) is located in the heart of the Jewish quarter. 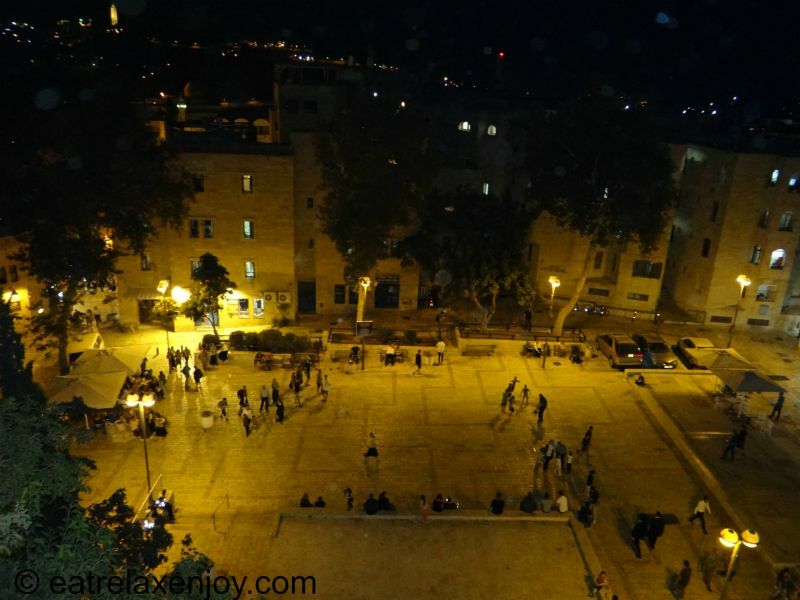 It is a beautiful building with a lot of history and a breathtaking balcony observing the interior of the synagogue as well as outside – overlooking the Jewish quarter. The Hurva Synagogue is located in the Jewish Quarter of Jerusalem. It was destroyed twice and was left in ruins for years, this is how it got its name. 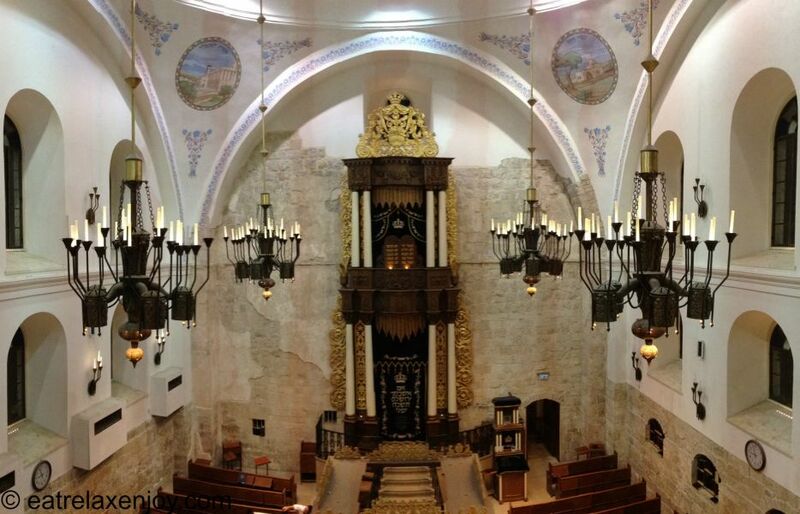 The Hurva Synagogue is located in the heart of the Jewish quarter in the old city of Jerusalem. However, when it was built, the old city was located elsewhere, and the local Jewish residents lived there, the new immigrants from Europe (Ashkenzai) settled where the current Jewish quarter is located. Around 1,700, Rabbi Juda Ha-Hasid arrived from Hungary with his group to build a synagogue in Jerusalem. However he fell ill and died before he was able to recruit the funds to build the synagogue/ His community built the synagogue by taking a loan, and when they could not afford it, the synagogue was seized and destroyed. It stood in this state for years, until in 1856 the Ashkenazi community from Zefat came to rebuild it after the earthquake. They believed that the earthquake happened because Jerusalem was not settled. They raised the money, and when they built it – it was the biggest and most beautiful synagogue in the country. Unfortunately, in 1948, the Jewish quarter was taken over and the synagogue, located on a high hill, a strategic location, was blown by the Jordanians. Only around 2006 the reconstruction began, and the synagogue was re-opened in 2010 as an exact replica of the 19th century’s synagogue. 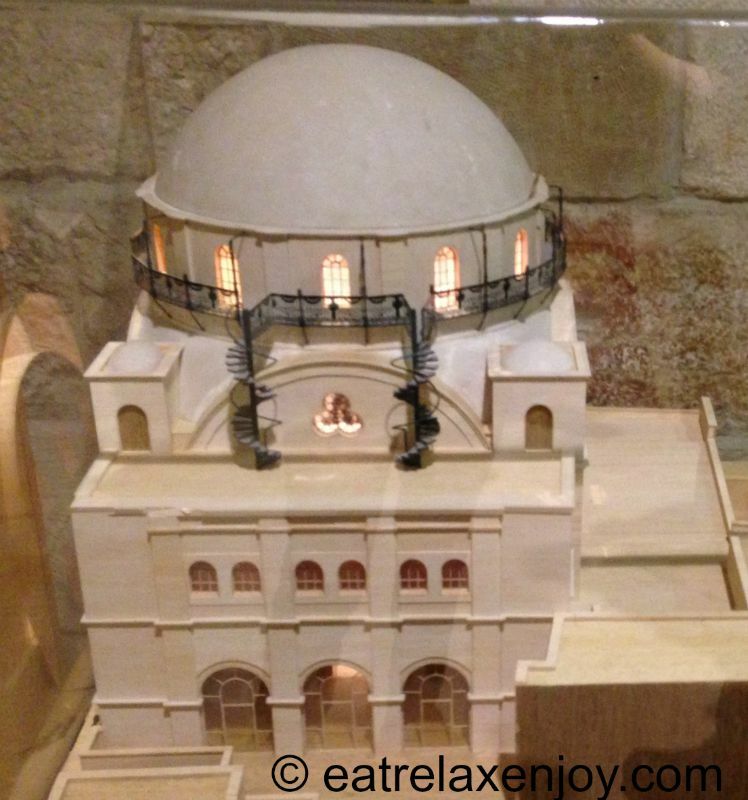 Here’s a model of the Hurva Synagogue (located in the hall of the synagogue). It is a very nice building, and there’s a balcony from which the view is magnificent. The Hurva Synagogue is closed to visits when prayers are in session (it is used by the local Yeshiva for studying). However, you may visit the women’s section when not in use and go up to the balcony, which is looking down to the synagogue and outside on the Jewish quarter. From the women’s section the interior of the synagogue can be nicely observed. The décor is exactly like it was in the 19th century. 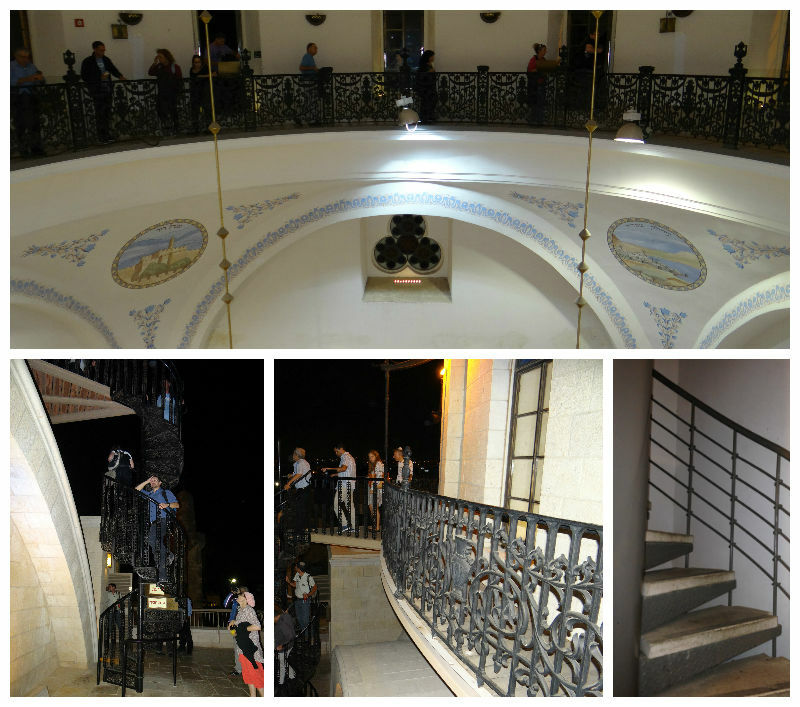 From there, there’s a climb up to the balcony via a round staircase (a bit tricky to climb and not accessible). The photograph below shows the the internal terrace and the climb up to the roof. The Hurva Synagogue is well-located high in the center of the Jewish quarter – it’s about a 1.25 km2. We visited the synagogue as part of a nightly “Slichot” tour before Yom Kippur (tour during the period around September when Jewish people pray at night to ask forgiveness). The photographs from the roof-balcony were therefore taken at night. But you can see how strategic this place is and can see a lot of the old city from the rooftop.